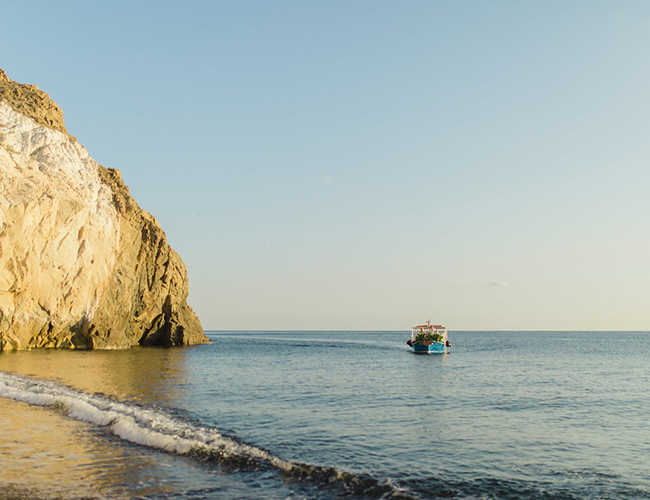 As if the beaches of Greece weren’t picturesque enough, Tie the knot Santorini designed the most beautiful day for this fun-loving couple to suit their style perfectly. 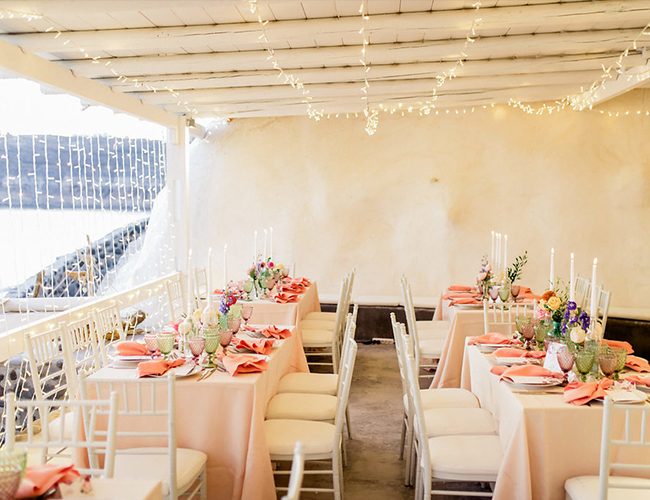 Their modern and bright wedding in Santorini features florescent orchids, pampass grass, and protea- and that’s just the florals! 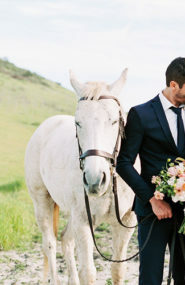 Then, there’s the grand entrance by the sea, and bridal party leather jackets to boot! 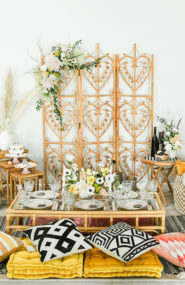 Tie the Knot Santorini says, We designed for Kim & Pierre a wedding that would ultimately express their amazing personalities: modern, fun, bold, colorful and bright. 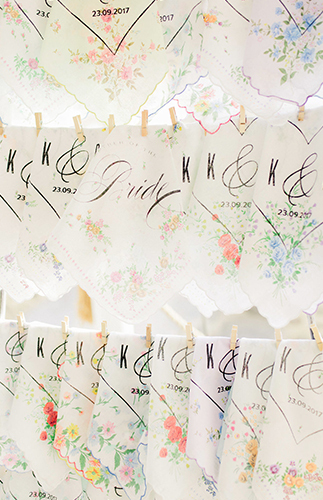 All these wrapped up with loads of love, matching the loving and caring couple that they are!! 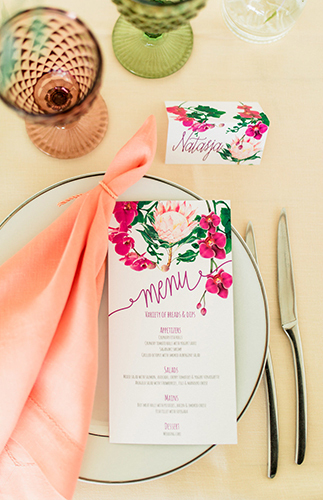 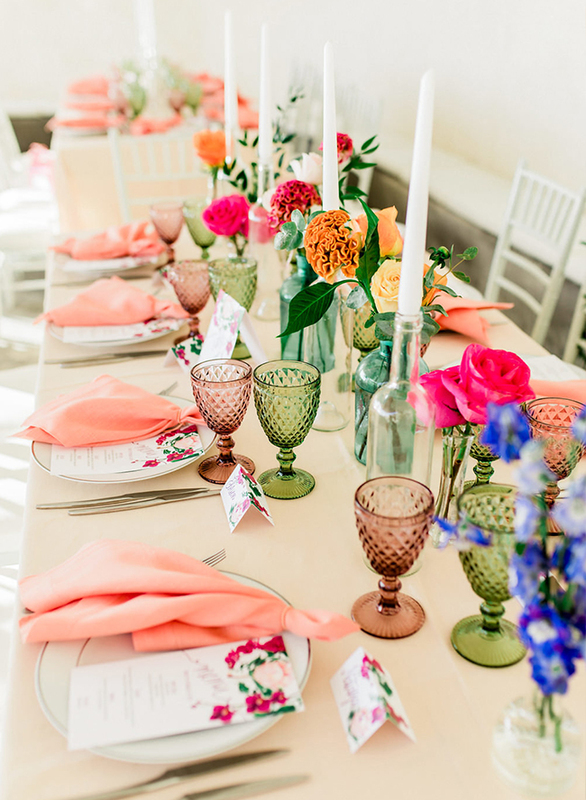 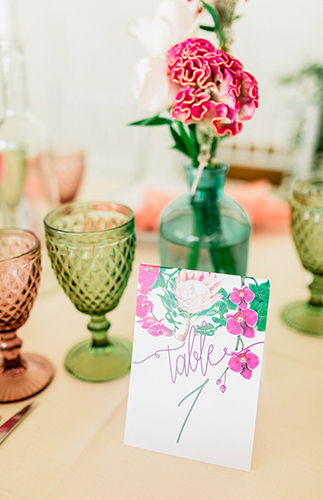 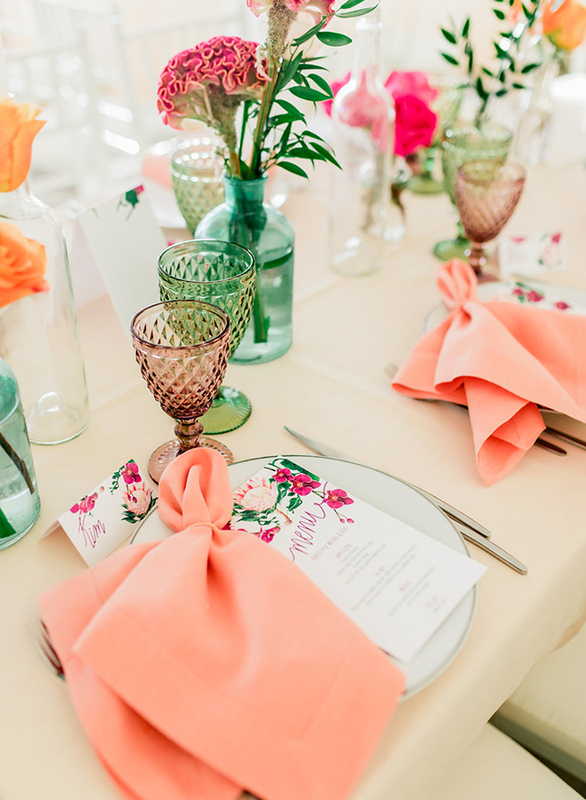 The table settings were as colorful and fun as it can be; pretty glassware, bright flowers and gorgeous stationery! 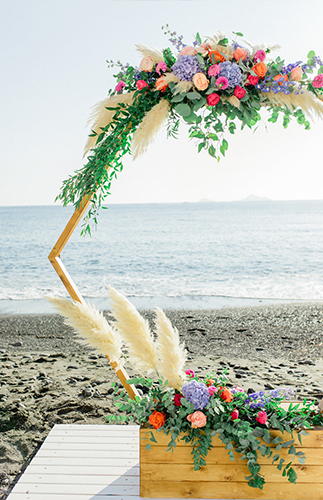 For the ceremony styling, we used a geometrical shape at the arch, fabulous intense colored flowers, and our favorite – pampas grass! 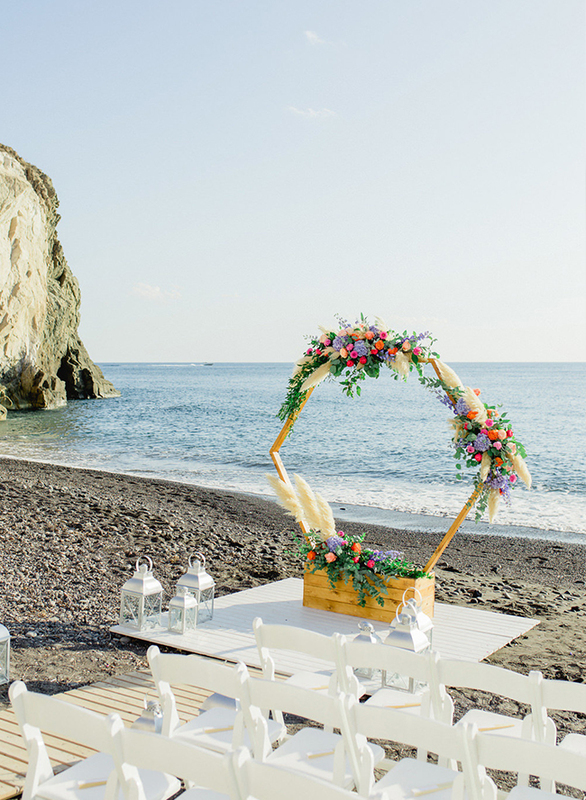 The backdrop of the natural landscape- the Aegean sea- made the wedding altar beautifully pop up. 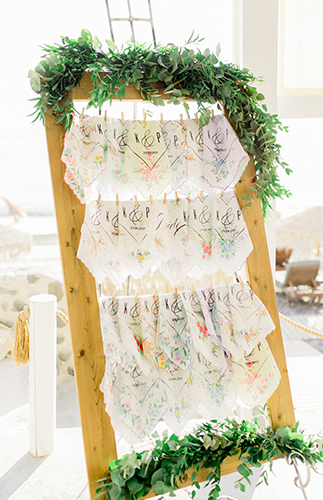 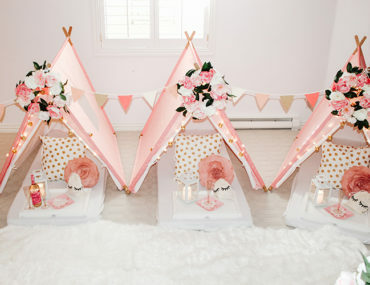 Of course, fabulous personalized details were added, such as the handkerchief with their initials, folders with olive leaves instead of rose petals, a mirror table plan, and loads of candles and fairy lights. 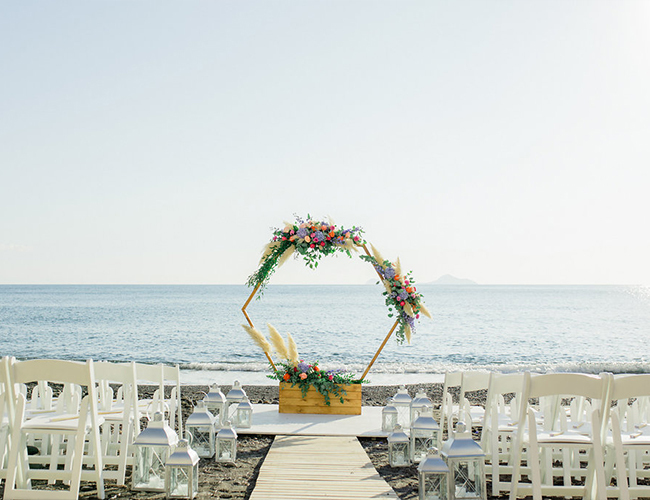 These beautiful decorations created a magical atmosphere at their beach venue! 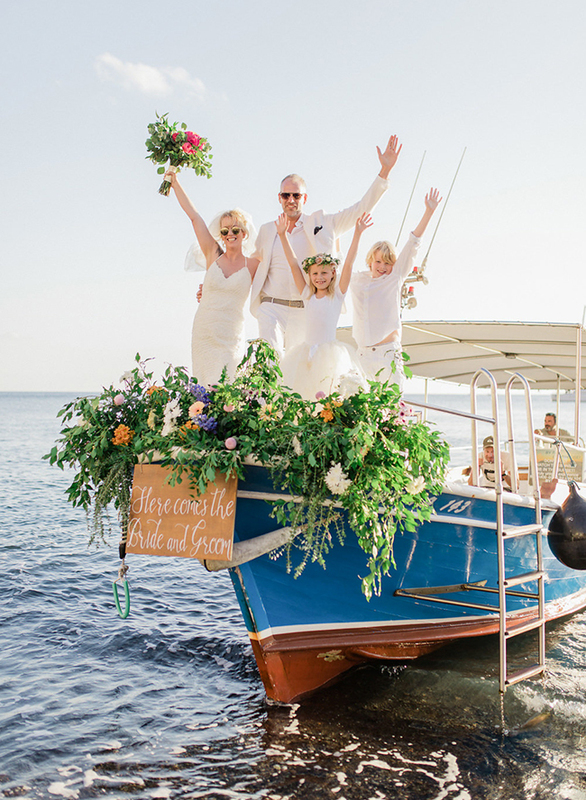 Our favorite detail: The entrance of the couple from the sea, with a traditional fisherman’s boat, which was decorated with cascading greenery and florals! 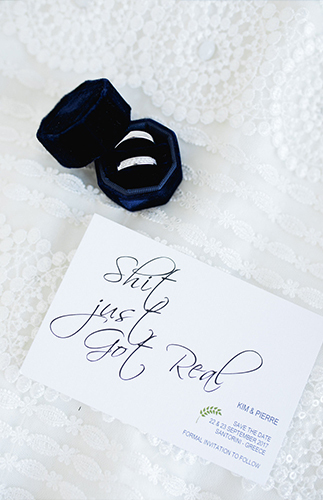 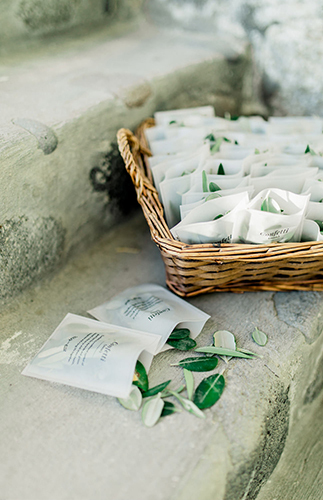 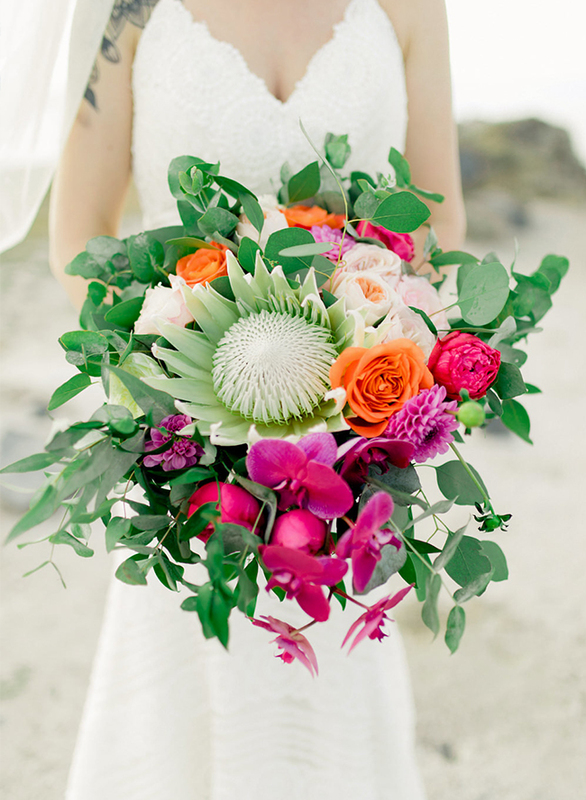 This wedding day truly was a modern fairytale by the sea! 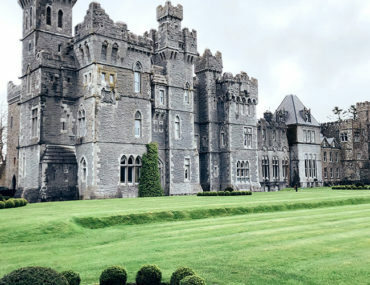 Isn’t it amazing!? 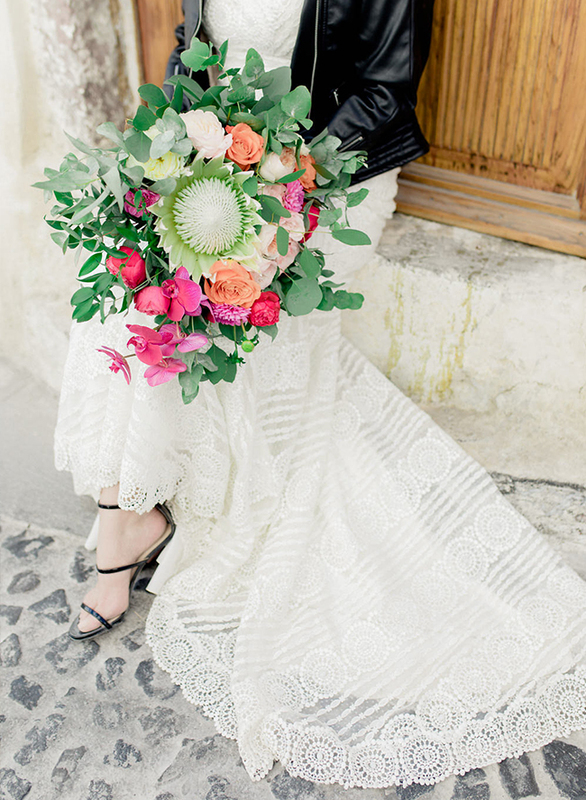 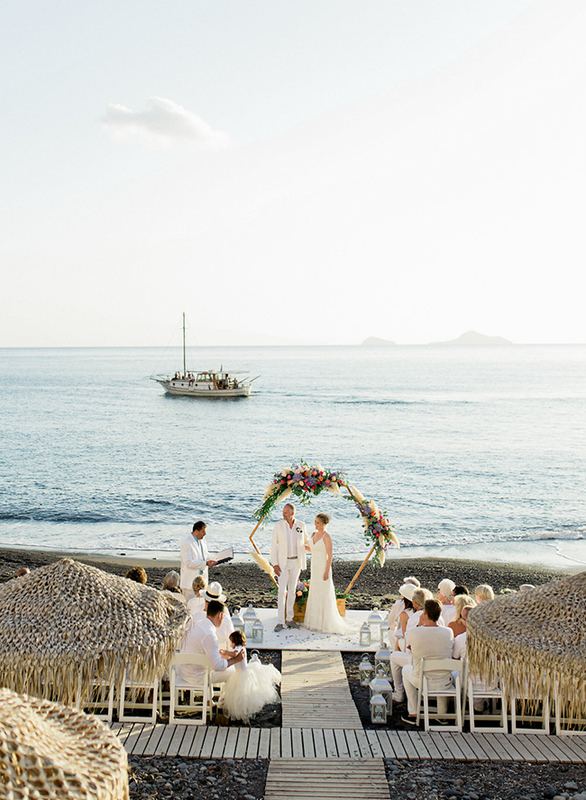 Swoon over this picturesque white wedding and this pastel wedding in Santorini next! 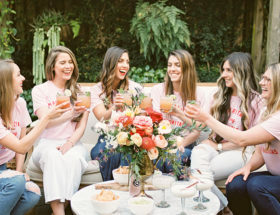 The photos are amazing! 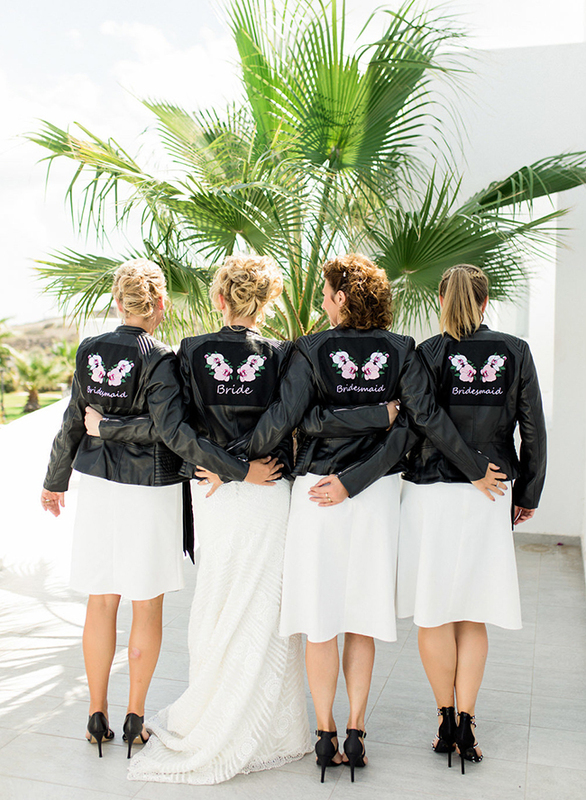 Loving the leather jackets for the bride and her squad! 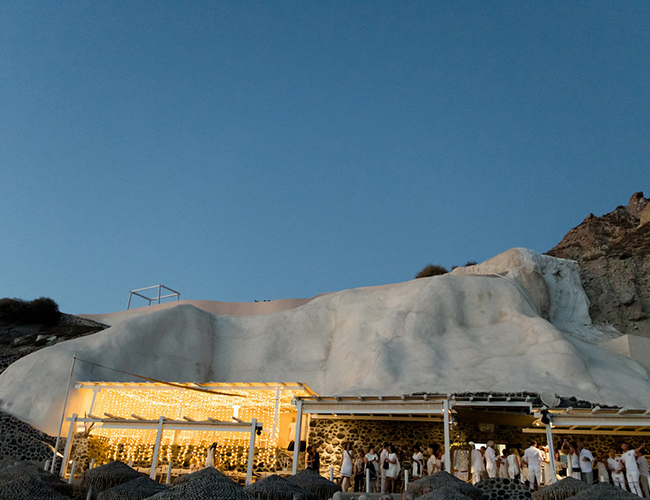 A Santorini wedding looks like an absolute dream!